Oklahoma has too many urban legends and myths to count. Some are real, and others are just tales that are told to explain different experiences. Don’t wait for Halloween to check out some of these creepy and odd places around our great state. Here are the 15 best! 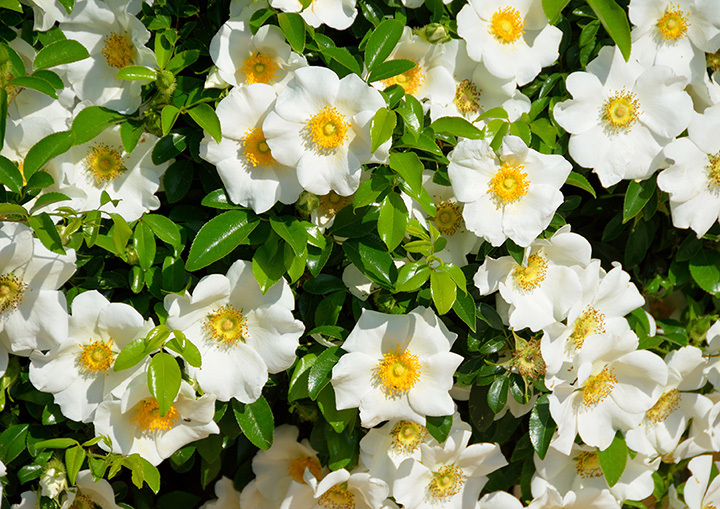 The Cherokee Rose is a seven-petal flower with a white center that grows along the Trail of Tears, the path the Native Americans took from North Carolina to Oklahoma when President Jackson forced the Cherokees and other tribes to move west. Legend has it that the rose grew out where the tears of the women fell onto the ground. The yellow center represents the gold taken from the Cherokee lands. Many people have reported a young boy, about 12 years-old, trying to catch a ride on Highway 20 in the Pryor area. He plays basketball and is totally willing to get in the car with you. He then vanishes before you are able to drop him off at his destination. There is a large concentration around Noble, Oklahoma. Legend says that God took the tears and drops of blood that the Cherokee shed on the Trail of Tears and used the barite crystals to form a rock that appears to be a blooming rose. A rose rock that blooms forever. The rose rock has been designated the official state rock of Oklahoma. This small hill looks ordinary, but if you put your car in neutral when you’re at the bottom of the hill, you will roll uphill. It’s almost as if you’re defying gravity. No one really understands why it happens, but there are many theories. Some say ghosts, some think it’s an optical illusion and others believe it’s a magnetic force. Still, it’s a great thing to experience. Carol Ann Smith lived at 10 E. 21st St. in Tulsa in the 1940s. The house is so-named because the authorities found two “religious slaves” living in the basement. Smith had reportedly put these women under a hex. She went to prison and when she was released, she left Oklahoma. The house is gone. It’s been replaced by a paved lot, but the basement was never dug up. Every Halloween, the memory lives on when a haunted house exhibition is held. The Purple Church probably takes the top spot for creepiest place in Oklahoma. It’s said that when you go into the opening, the walls of the church are covered in Satanic verses written in purple ink. If you’re brave enough to visit the site, you might see dead animals at the opening and hear demonic voices. Some say they’ve even found bones and pentagrams from Satanic rituals performed on site. Eerie. Camp Scott, a Girl Scout camp just east of Tulsa, was a peaceful retreat until 1977. During the staff training, someone left a note in one of the counselor’s tents, threatening to kill three girls that summer. Law enforcement dismissed it. During the summer camping season, three girls were brutally murdered. A counselor discovered the bodies one morning on her way to the showers. No one was ever brought to justice, even though people reported two suspicious men in the area on the night of the murders. No Girl Scouts have camped there since that awful night. Legend says that the stikini, a vampire-witch of Seminole lore, came to Oklahoma when the tribe was forced to relocate. The stikini are human by day, but each night the human form vomits its internal organs which allows it to shape-shift into an owl. The owls roam the countryside, ripping out human hearts, which it must eat. Before daybreak, the stikini returns to its organs and swallows them to return to human form. If you hear the cry of a stikini, you will die. Built in 1903, this Victorian mansion belonged to Henry Overholser, who many call the “Father of Oklahoma City.” It was once a center of social life and parties of Oklahoma elite. In 1970, the mansion was officially listed on the National Register of Historic Places. Visitors report apparitions that pull hair or push the visitors around. Some of the spirits knock on door. It’s a historic and haunted mansion that you’ll want to tour. The Stone Lion Inn is a great place to stay, but it has a macabre history. Its original owner, F.E. Houghton lost one of his children to whooping cough when she was given the wrong medicine by mistake. The child’s ghost now haunts the inn and plays with the toys of the children who stay there. When Houghton’s family moved out of the mansion, it was turned into a funeral home for a few years before becoming the inn it is today. Mr. Houghton also haunts the guests at the inn, but he’s quite helpful and hospitable.